Open Golf Club’s current portfolio of golf courses spans four countries – France, Belgium, Spain and Morocco – and eight of the layouts are situated within the Provence-French Riviera region. Set in the foothills above Cannes, Opio Valbonne lies less than a ten-minute drive from another Open Golf Club facility at Golf de la Grande Bastide. 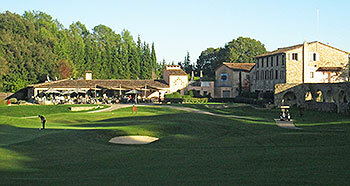 The Opio Valbonne course is a Donald Harradine design – one of three French golf projects the architect was involved with in the early 1960s (the other two were Rochefort en Yvelines and Chaumont en Vexin) – and it occupies a relatively small portion of an enormous 220-hectare property which has at its centre of activity the recently renovated Château de la Bégude. It’s a totally charming place to play golf, where tree-lined fairways return in two loops of nine to an open courtyard area that nestles between the clubhouse and the hotel. An old Roman aqueduct adds even more appeal to this rather attractive 19th hole setting, running along the right hand side of the 18th fairway. I’m no lover of fairways that dog leg at a right angle off the tee and Opio Valbonne opens with just such a hole, unfortunately. Later on the front nine, at the par five 7th, the angle of bend in the fairway is even greater so you can take it as read that those two particular holes are not on my list of favourites. In fairness, to counter those two negatives, the uphill par three at the 5th is a fine short hole, as is the short par four 9th, where a stream cuts diagonally across the fairway where it kinks left towards the green. It all becomes a little cramped between holes 11 and 14, which run along the floor of a rather narrow valley, but then we return to my golfing aversion of the front nine – the excessively doglegged fairway! Hole 15 has been remodeled in recent times to horseshoe round a hillside to a new green, leaving the old green as the putting surface for a new par three finishing hole. There must have been a good reason for the revamp (presumably to allow both nines to end in front of the clubhouse) but I’m not so sure the modifications work that well, especially when the natural line of play on the 15th is to the original green, not round a corner to a green perched up on a hillside! The old par three 16th no longer exists and old holes 17 and 18 are now played as 16 and 17, with the new 130-metre 18th played from an elevated tee position next to the Roman aqueduct that bounds the closing hole. Granted, it’s a very pleasant way to end a round but the somewhat contrived new course routing makes me wonder if it was a price worth paying to achieve a relatively lacklustre finish.